This is a lovely story from the wonderful Luangwa valley in Zambia. A brilliant place to see ellies and especially good for leopard sightings too.! On 19th August we took into our care an orphaned baby elephant. He had fallen into a pit in a village 40 miles away and was unable to get out. He was all alone, with no sign of any other elephants nearby. A rescue team from the South Luangwa Conservation Society (SLCS), led by Rachel McRobb, was able to pull him to safety and with the permission from the Zambia Wildlife Authority (ZAWA) They brought him to Chipembele in the back of a Land Cruiser pick-up. 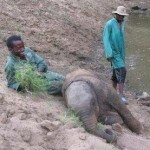 He was named Tafika, after a nearby tourist lodge that reported his predicament, and is about one year old. Tafika means ‘to arrive’ in the local language. Orphanage. They are both doing very well. A KEO elephant specialist, Rachel Murton, and an experienced Zambian elephant keeper, Gift, arrived here within 24 hours to help advise us and set up a feeding and care system. Two additional keepers and a full time SLCS scout were also engaged. There is at least one keeper by Tafika’s side 24 hours a day… coming from a tight knit family he can never be left alone, even through the night. Rachel left after a few days… thanks for all your wonderful help and advice Rach!… but left Gift behind to manage Tafika’s care. When he is moved to Kafue, at least he will know Gift. Tafika is now doing just fine and has bonded to his new keepers. He has adapted incredibly well to his new surroundings, despite the trauma of somehow losing his mother. He has just started daily walks and loves to play in a nearby water pool. With ZAWA’s approval we are planning to move him to the Kafue Oprhanage within the next month or so. It is a 30-hour road journey, which would be too stressful for such a young elephant, so he has to be flown via a charter flight. As you may well imagine, caring for Tafika is hugely expensive. In addition to the milk (now 18 litres a day), mineral supplements, vegetables from the market etc. there are keeper and scout wages and money for food rations/equipment that have to be found. We also urgently need to raise the funds to make his flight possible. He needs to be with other elephants soon… in fact his future welfare depends on it.